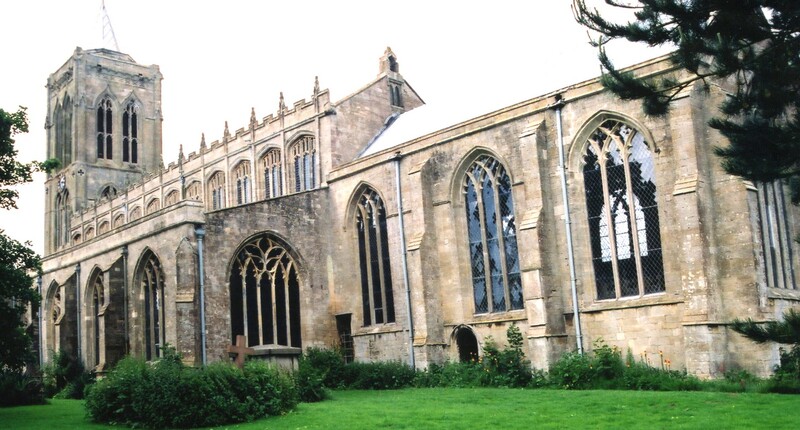 "This place has long been famed for its beautiful church, which is dedicated to St. Mary Magdalene, and is supposed to have been erected by the abbots of Crowland, who had a house and large possessions in the parish; it contains fifty-three windows, those of the north aisle having considerable remains of stained glass. The living is a vicarage, in the presentation of the crown. In this parish there are some vestiges of entrenchments, conjectured to have been the site of Roman fortifications." The Gedney Parish Council has information on the cemetery at Dawsmere. The parish was in the Long Sutton sub-district of the Holbeach Registration District. You can also perform a more selective search for churches in the Gedney area or see them printed on a map. The Anglican parish church is dedicated to St. Mary Magdalen. 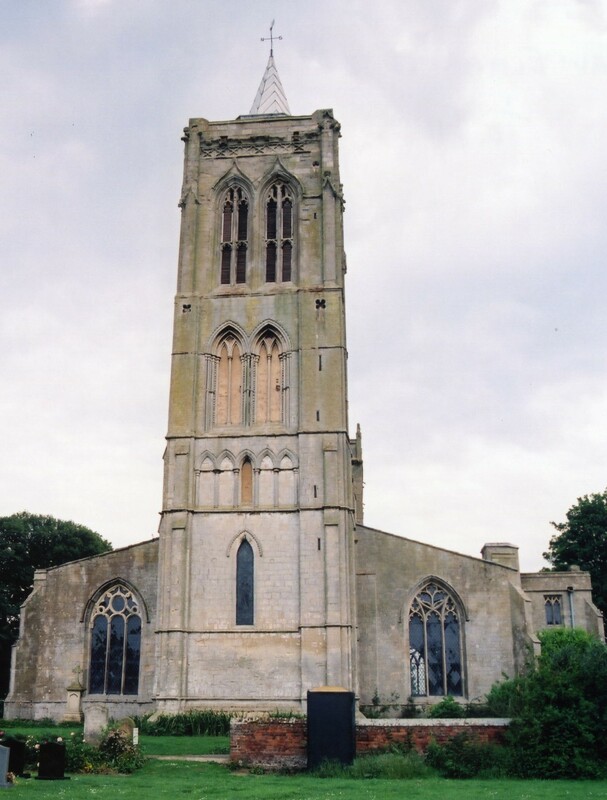 Some portions of the parish church have been dated back to 1280. Inside is a font with a date of 1664. The pulpit was made and carved around 1700. Some of the tombs and brasses date back to 1400. For more detail, check the Church Mouse website. The church was restored in 1896 thru 1898. The church tower is 86 feet in height. 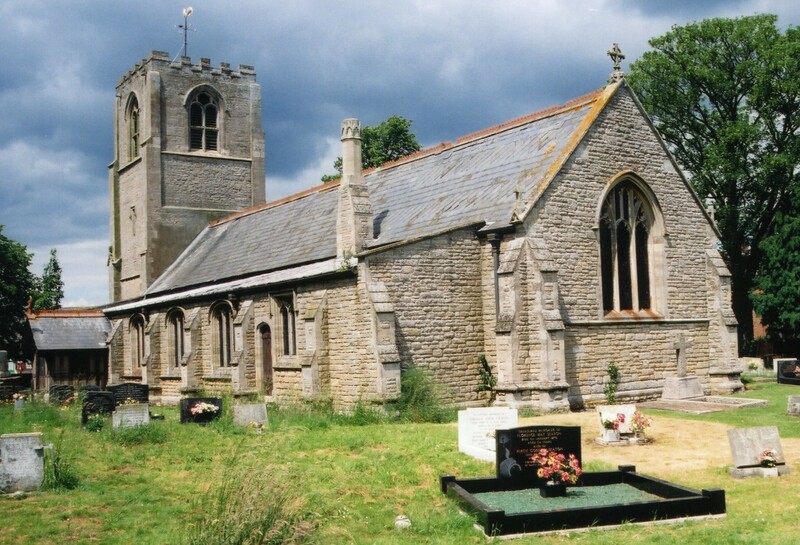 A photograph of St. Mary Magdalen church is at the Wendy PARKINSON English Church Photographs site. Gedney Dawsmere has a church, Christ Church, which was erected in 1869. Originally the parish included the area to the south known as Gedney Hill, but that area became its own parish centuries ago. 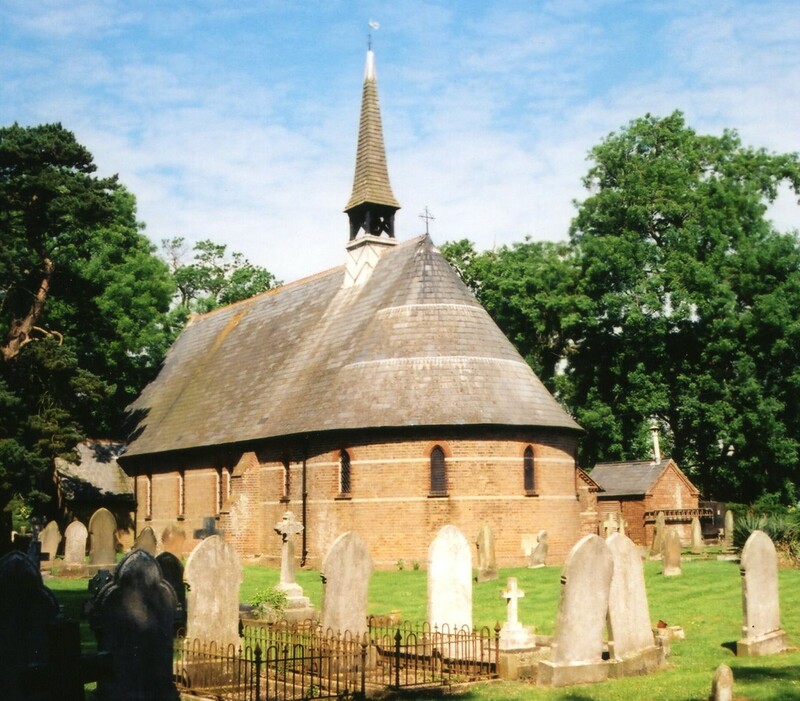 The church there, Holy Trinity, dates to about 1400, but was rebuilt around 1870. The Anglican parish church registers exist from 1558. We have the beginnings of a Parish Register extract in a text file for your use. Your additions and corrections are welcome. The Lincolnshire FHS provides several indexes of the East Elloe Deanery to make your search easier. A lot of the parish registers for Gedney have been transcribed onto FreeREG and can be seached onlione. These include: Marriages 1754-1812; Baptisms 1753-1846; and Burials 1754-1921. The Weslyean Methodists had a chapel at Gedney and another at Gedney Dyke, and the Baptists one at Gedney Broadgate. For information and assistance in researching these chapels, see our non-conformist religions page. The parish was in the was in Long Sutton sub-district of the Holbeach Registration District. Gedney is both a village and parish about 100 miles north of London, 3 miles east of Holbeach, about nine miles east of Spalding and nine miles north of Wisbech. Holbeach parish and Fleet parish lie to the west. The parish is a long, narrow affair running roughly north and south and originally extended to the border of Cambridgeshire. It includes the hamlets of Gedney Broadgate, Gedney Drove End and Gedney Dyke. The A17 trunk road runs through the parish. The area is marshy, drained by many small canals and the South Holland Main Drain. A full Gedney is what you can claim to have achieved if you have visited the six settlements in the South Holland district of Lincolnshire, with Gedney in their name. These are Gedney Hill, Gedney Broadgate, Gedney, Gedney Dyke, Gedney Drove End and Gedney Dawsmere. You are also required to have visited Gedney Fen in order to claim a full Gedney. You also need to have visited Gedney Marsh but this is synonymous with visiting Gedney Drove End or Gedney Dawsmere and therefore gains no extra credit. Suprisingly few people can claim to have a Full Gedney, even many who live in one of the Gedneys cannot claim it, as it is 13 miles from Gedney Hill to Gedney Dawsmere. Note that you are not required to visit Gedeney Road in Tottenham, London. Coming into Gedney Dyke there is a large barn being constructed and a large amount of pallets stacked up which are marked AAC. Surveillance cameras are in operation at The Chequers Pub in Gedney Dyke. There is a house in Gedney Dyke called Pooh Corner. On the way out of Gedney Dyke there is a bit of a mound like rise within a field which could almost be described as a hill in Fenland terms. H C Goose and Son have White House Farm between Gedney Dyke and Gedney Drove End. JEPCO (J.E. Piccaver & Co) have a circular mirror opposite their entrance near Gedney Drove End. The General Store in Gedney Drove End is called the Old Wheat Sheaf. The pub opposite the Old Wheat Sheaf Store is called The New Inn. The Rising Sun in Gedney Drove End offers Real Ales, hot and cold food and children are welcome. The Methodist Chapel in Gedney Drove End is dated 1885. Onslow House retirement home is situated in Gedney Drove End. There's actually six Gedneys as when you get to Gedney Drove End there's a sign saying Gedney Dawsmere 1.5 mile. At Gedney Dawsmere there is a cemetery which is nowhere near full. Ask for a calculation of the distance from Gedney to another place. You can see the administrative areas in which Gedney has been placed at times in the past. Select one to see a link to a map of that particular area. Much of the parish area once included a large number of salterns for reclaiming salt from seawater. Inside the churchyard at Dawsmere is a tall, slim monument. To see it and the names on it, see the Roll of Honour site. A view of the War Memorial at St. Mary's Church also shows the names listed. There is also this list from Gedney Dyke. The name Gedney is from the Old English gaeda+eg, or "island of Gaeda". In August, 1882, Gedney was enlarged by gaining the "Gedney Marsh" portion of Gedney Hill Civil Parish. In April, 1932, Gedney swapped a 4 acre parcel with Lutton Civil Parish for a 10 acre parcel in that parish. You may contact the Gedney Parish Council regarding civic or political issues. They are NOT staffed to assist you with family history questions. The WELBY family left land and houses for the relief of the poor, as did the reverend FISH. The proceeds were distributed yearly on St. Thomas's day and Good Friday. After the 1834 Poor Law Amendment Act reforms, the parish became part of the Holbeach Poor Law Union. Anne COLE tells us there are no Poorlaw records in the Lincolnshire Archives for Gedney July 2011. A school was built here in 1864 to hold 150 children. A school was built in Dyke in 1875 to hold 40 children. It was enlarged in 1896 to hold 60 children.